I am beyond happy. Absolutely stunning craftsmanship. Service was exceptional and communcation amazing. I can’t think of words to decribe how happy I am with our invitations. Thank you Linda!!! Linda, We have our invitations and they went out this weekend! We absolutely LOVE them. Thank you so much for taking me through this process. Planning a wedding can be stressful and you made this part easy, thank you for that. We looked for a long time on invatations. I was hesitant to buy online before really seeing anything. I loved these but thought price was a little high. We kept looking and I kept coming back to these. OMG! I am go glad we wnt with these. Linda as so helpful and easy to work with. 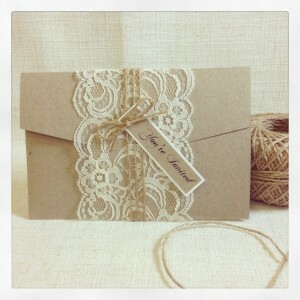 Everyone has commented how much they love the invatations and the best they have ever seen for a wedding!! Thank you so much for starting our crazy wedding planning off right!! 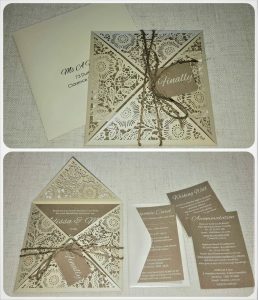 The invitations were incredibly elegant and perfect for our event. Linda was so easy to work with and quick to respond to any questions. 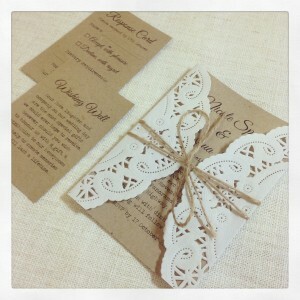 We have had nothing but compliments on the beautiful invitations. 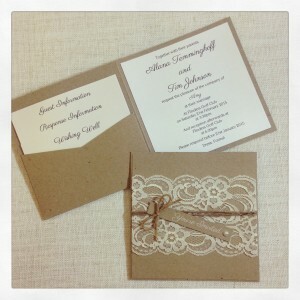 We love our invitations! From Australia to Los Angeles. I was hesitant to purchase considering the distance, I even ordered multiple samples. But nothing could compare to these. They are just as gorgeous in person. 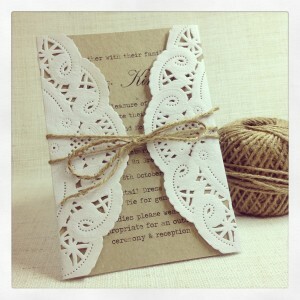 The quality of the lace and stock paper are amazing. The best part of designing our invitations with working with Linda. She really answered every question and every email so quickly it was great! She really walked us through every step and made it so easy and convenient. We are very happy with the end result and we just sent them out and have already gotten compliments on them ! Thanks Linda for all your help! Highly recommended! 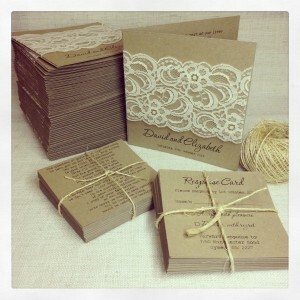 I wasnt home when the invitations were delivered, so I picked them up on the weekend.. Thank you so much for them, I absolutely love them and cant wait to show them off once I give them out. Thank you for your patience, time and effort! Will be contacting you for anything else I need, thank you again! we love our invitations. thank you Linda, you were amazing to deal with. 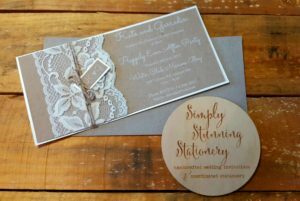 would highly recommend simply stunning Stationary!! 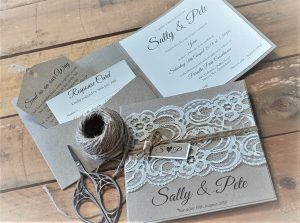 I just wanted to share with you some very lovely feedback on the stunning invitations you created for Pete and myself. I sent an invite to my great Aunty in Woodend Victoria. It made it in one piece. The best bit was Aunty Nola said it was the most beautiful invitation that she has ever received. And that she will keep it for as long as she can. 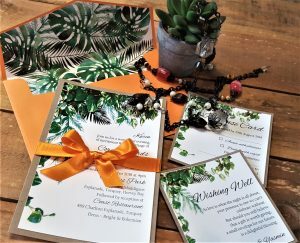 Thank you again for my beautiful invitations and your professional service. Happy for you to share!!! All i can say is OMG i am in love with the place cards you did a bloody great job, you are a legend. I will be recommending you to everyone, i am so glad i did business with you. Thank you so much for the amazing service and product we have received from you. 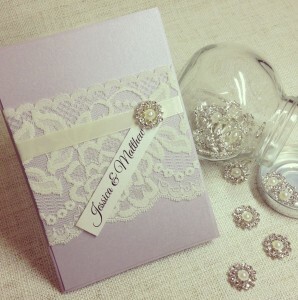 We received our beautiful invites the other day & are super happy with the finished product. 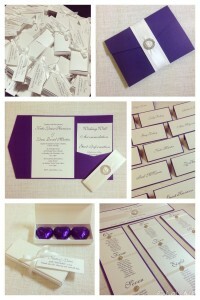 We will definitely be recommending your company should anyone need any invites or stationary for a special occasion. Once again, thank you for an amazing product and service. Absolutely beautiful handmade pieces. I cannot thank you enough Linda. 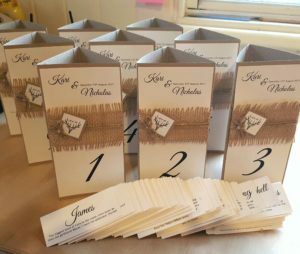 The invitations, Table numbers and name cards were all a perfect match to our elegant beach wedding. Thank you Linda! Our invitations turned up today and the are amazing! 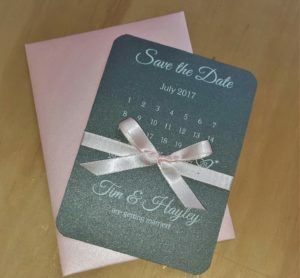 Linda went above an beyond, she didn’t have the design I like, but found it and worked with it and we got an invitation better then we could imagine. Linda guide us through the whole process as we didn’t know what we were doing and have nobody helping us. A true god send! Thank you!!! 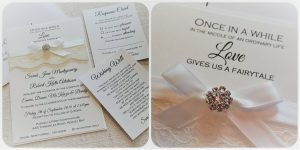 What beautiful wedding invites Linda created. Great quality and quick service. 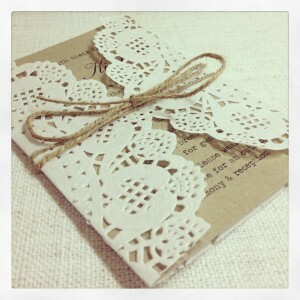 Thank you Linda for my beautiful invitations. Not only is the product perfectly created but it was made efficiently and dealing with Linda was always a pleasurable and professional. Couldn’t be more happier with the result. 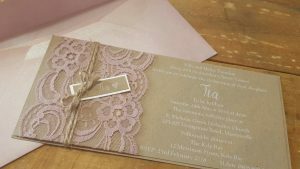 Highly recommend Linda to custom make your invitations! Just wanted to say a big thank you for the invitations. You did a fantastic job – they are stunning! I’ve been meaning to write this for a while now but I still struggle to find the words to describe the perfection that is Linda’s work. 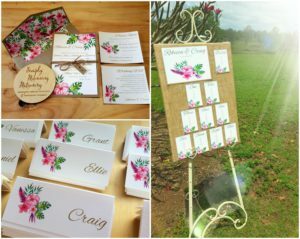 From invites, to place cards, signs and table menus, everything was just 100% perfect and exactly what we had imagined. Keep up the beautiful work Linda! 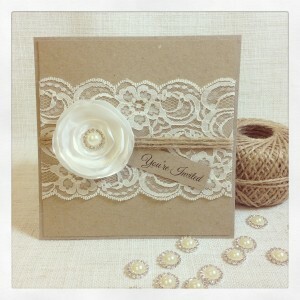 Click here for rustic invitations. 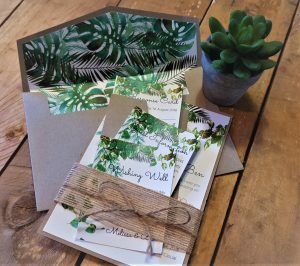 Our wedding invites and stationery is perfect! Cannot wait to display it all at our wedding reception. Thank you so much Linda for all your hard work, they all look amazing. 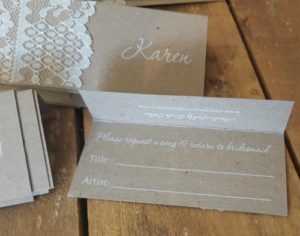 Click here for rustic laser cut invitations. Absolutely amazing! i love my wedding invites, they are perfect. 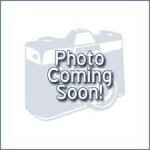 Fantastic service as well and made the process so easy. Thanks so much!! 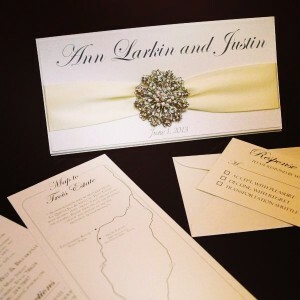 Linda was so wonderful to work with throughout this wedding invitation process. 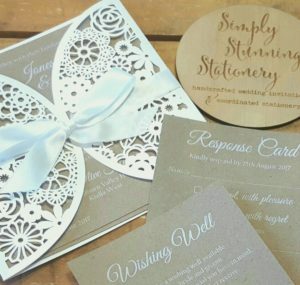 I couldn’t have asked for better quality invitations or better timing of her services! Absolutely beautiful and what a professional to work with! Highly recommend! 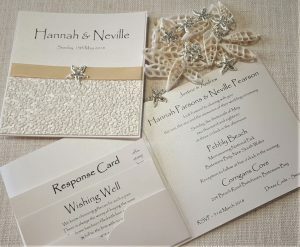 Click here for coastal beach invitations. Thank you so much Linda. I can’t wait to see them! You have been so prompt and helpful. If I need anything else I won’t hesitate to ask you and use your services again. I just received them! They are beautiful! They exceeded my expectations. You are amazing. Have a wonderful week. 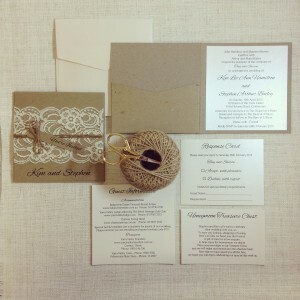 The invitations arrived today … they are fantastic! Thanks for packaging them up so safely. I’ve put the stamps on tonight and popped in the post. Thanks for your organisation, efficiency, wisdom and ability to work within our time frames. It was an absoloute pleasure to work with you. OMG Rachael thank you so so so much for our amazing stationary and guest book it’s seriously amazing I am so excited to use it on our wedding day. You have done a brilliant job thank you so much! 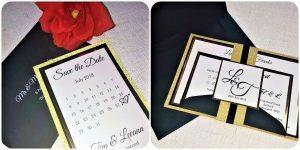 I received the invitations today and LOVE them!! Thank you soooo very much, they are beautiful. I only wish I had discovered you earlier. We received or invitations and thank you cards. I just wanted to say that I absolutely love them! They are truly stunning and just what I imagined. It is PERFECT!!!! I am so happy with everything you have done. I have already recommended you to friends of mine and directed them to your page!!! I cannot thank you enough! With everything you have provided I know what I was picturing in my head will look amazing!!!! 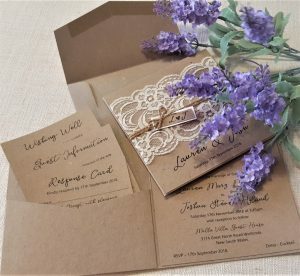 We received our invitations on Wednesday and they were just as gorgeous as I’d hoped. I’ve handed some of them out personally and the feedback has been so positive – everyone loves them! I can’t wait until the rest of my guests receive them via the post. Anyway, thank you so much again for your patience and all the hard work that went into making them. I’ll be definitely recommending you to friends and family. Just wanted to let you know that I received the invites on Friday and I couldn’t be happier. They are absolutely perfect! I’ve already started handing them out and I’ve had such nice feedback about them, most people have said they haven’t seen anything like them! 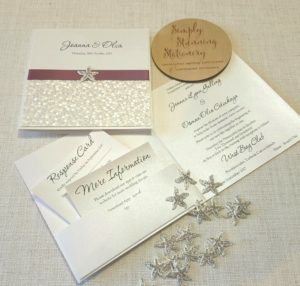 Thank you so much, I’m so glad I came across your page on Etsy, you have been lovely to deal with and your products are amazing, I can’t wait to see the seating chart! You have an amazing talent & I will be highly recommending you my friends!! 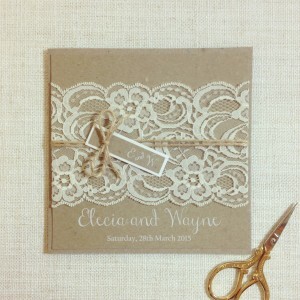 These invitations are absolutely lovely and delightfully perfect! I would hug you if I could! Rachael is an absolute pleasure to work with. 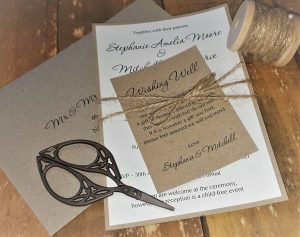 The invitations arrived promptly and were above and beyond my expectations! 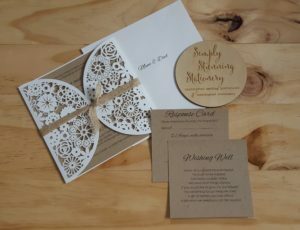 I would HIGHLY recommend her and her work to anyone looking for invitations. The finished product is beautiful and very well made and her attention detail is remarkable. I am so happy with my order. My fiancé and I could not be happier with our wedding invitations! Rachael was a great pleasure to work with. She was very prompt and the despite the distance, I felt like I was working with her in person. She did an amazing job and has fans in Dallas, Texas! Thank you Rachael!!! 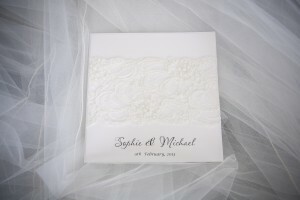 We absolutely love our wedding invitations from Simply Stunning Stationery! Thank you so much Rachael. They are so beautiful and we’re so grateful for all your hard work and going out of your way for us so we could get them out quickly. 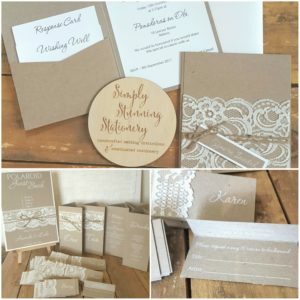 🙂 We looked extensively at stationery designers but no-one else came close to you! Your work is gorgeous! 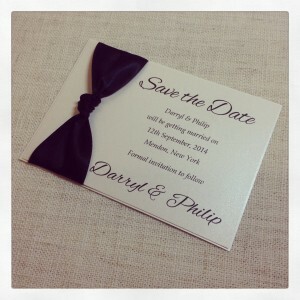 Our guests adored their save-the-dates so we just know they will love the wedding invitations too. 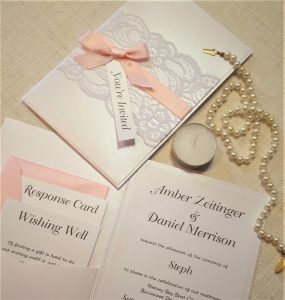 We will be sure to send you a professional pic of our invites on our wedding day. 🙂 Thanks again, Sophie and Michael. The invites arrived and they look amazing, even better than I imagined! Thank you so much for doing such wonderful job in such a tight timeframe. I can’t wait for my guest to see them. I will definitely be getting the menus made as well.